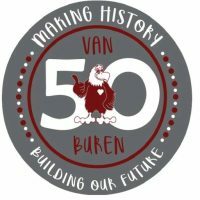 Van Buren Elementary School will host a 50th Anniversary Celebration with an Open House and Art Fair on Thursday, April 11th 2019 from 4:00 PM – 7:00 PM. The public is welcome to join students, families, alumni, and community members for this celebration. ● 4:00 PM, Student artwork on display throughout the school; student leaders will share their personalized, hands on learning experiences from Van Buren; Van Buren state level Eagles Robotics Team will demonstrate their robotic talents; Guests are encouraged to help create an interactive art project to commemorate the 50th anniversary. ● 5:00 PM, Student leaders will hold a ceremony that includes a ribbon cutting and presentation of the Van Buren time capsule. ● 5:45 PM, The band and orchestra will perform. ● 6:45 PM, A winner will be drawn for the PTA raffle basket. Van Buren students far exceeded their goal of collecting at least 50 items for each organization, and look forward to giving back to their community with their donations.